Craftwork IV. May Day BANK HOLIDAY Soiree! You know the drill by now. 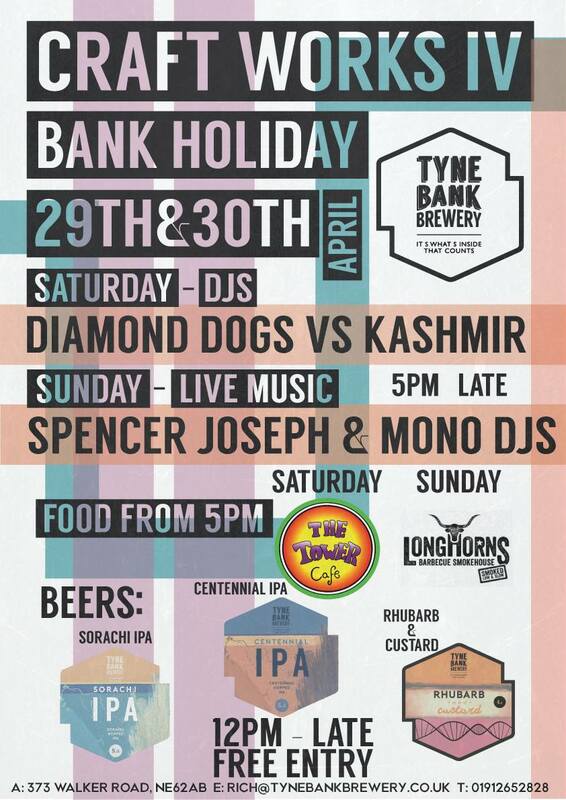 Its our end of month soiree featuring some of the best food vendors, DJ's, musicians and Beer in the North East. Over Saturday 29th & Sunday 30th April we'll be welcoming the return of some old favourites as well as some new faces. The Tower Cafe return on Saturday with arguably the best pizza in Newcastle, serving pizza-by-the-slice in their authentic Italian style, sounds delicious doesn't it? Sunday we see the debut of Longhorns, American smokehouse food at its finest. Brisket, pulled pork and nachos. Their reputation proceeds them wherever they go, so they're not to be missed. We have brand NEW BREWS just for you's. AND THE RETURN of our Rhubarb and Custard oatmeal pale ale. A springtime delight brewed with fresh Yorkshire Rhubarb, vanilla and lactose. A real British delight. Providing the music on Saturday night we have DJ sets from Diamond Dogs and Kashmir playing from 5pm. Sunday is for live music and vinyl, Spencer Joseph returns bringing his sumptuous acoustic musings and Mono DJ's see the weekend out with a vinyl tracks.